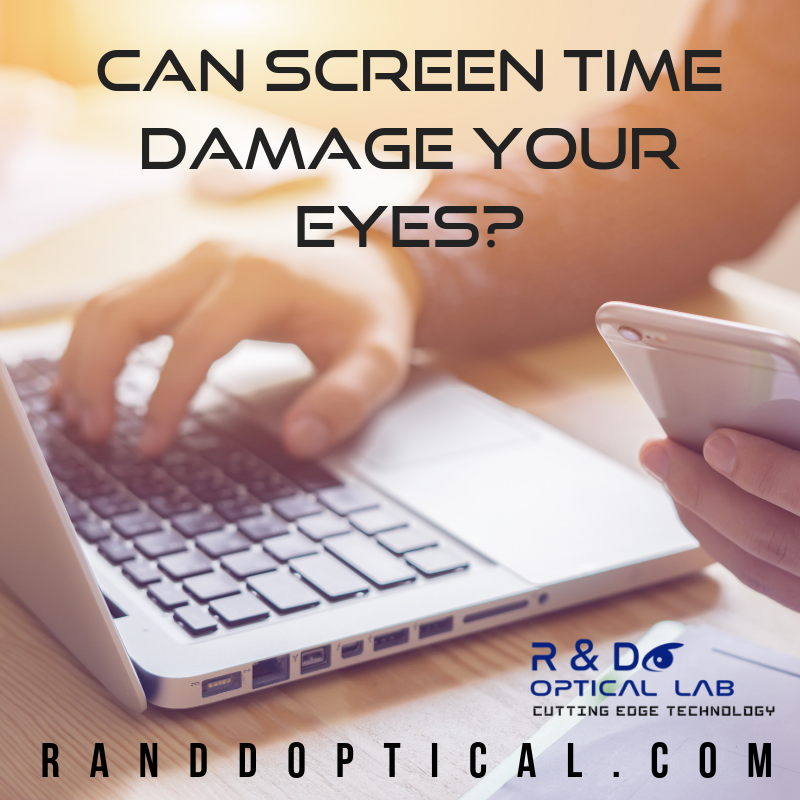 At R&D Optical lab, we hear a lot of questions about how screens affect our vision. Believe it or not, the average American spends nearly 11 hours a day in front of their screens. Considering staring down at a screen for nearly half the day can cause you to suffer from “tech neck,” a condition that can lead to disc degeneration and nerve damage, imagine what all that staring does to your eyes. One of the main concerns around screen time and eye health is blue light, which our devices emit. Although the sun also emits blue light, devices such as smartphones, laptops, tablets and other handheld devices are held close to the eyes, which can damage the eye’s retina, causing irreversible damage. Our eyes produce retinal when triggered by a blue light. This retinal causes chemical reactions in the eye and can, in effect, poison your photoreceptor cells, and damage them beyond repair. Other common eye problems eye care providers see are blurred vision, dry or red eyes, double vision, headaches and eye irritation. These problems are due to the way we interact with our screens — sitting in front of them for long periods of time, blinking less, not taking enough breaks to rest our eyes, sitting too close and dealing with too much glare. Unfortunately, completely eliminating our screens probably isn’t an option for many in this day and age. But there are steps you can take to ease the discomfort in your eyes and keep them healthy for years to come. What Helps Eye Strain from a Screen? 1. Get Rid of the Blues. If you wear glasses (or even if you don’t), you can benefit from a pair of glasses with blue light protection. Computer glasses have a special blue-light filtering coating that can protect your eyes from screen damage. This will, in turn, help your eyes feel less fatigued, irritated and dry, and can help prevent headaches and dizziness brought about by too much screen time. 2. Remember the 20-20-20 Rule. For every 20 minutes you spend staring at a screen, take a 20-second break and look at something 20 feet (or more) away. This can help your eyes refocus and give them a break. Set an alarm if you have trouble remembering to take breaks. 3. Adjust Your Monitor. Make sure your desktop monitor to further ease eye strain and irritability. Your monitor should be high enough that the top is at or slightly below eye level. Your eyes should move slightly downward when looking at the middle of the screen. The monitor should also be no more than 20 inches from your eyes. The larger your screen, the further away it should be. 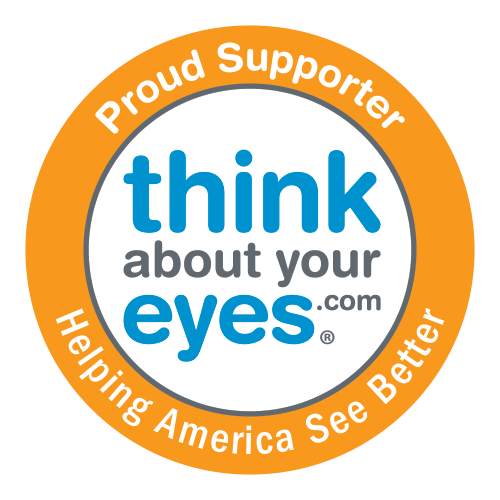 Ask your optometrist if you could benefit from a pair of computer glasses and/or special lenses with LET (Light Enhancing Technology) and lens material with blue-blocking properties.Ask for the best lenses available, Visual Perfection with LET, to help protect your eyes from the damage of too much screen time.